I still hand write letters in a festive card with a return address sticker. I might even decorate the envelope with a rubbe-stamped dolphin stampede. I still write letters and I still have pen pals. My favorite pen pal? My grandmother. I call her Mommom. She’s rad. I don’t know how she would feel about me calling her rad. She writes me short letters during the break she takes on her morning walk. These letters are usually written from her favorite bagel shop. Letters always include some sort of loving greeting, an update about her walking adventures and the bagel shop, something about an upcoming trailer trip, inquiries about my little sister, and an abrupt closing. Short, sweet and to the point. The best part about being pen pals with Mommom is that she will not let me slack off. If I haven’t written her a letter in a few weeks, I’ll get another letter urging me to, if I know what’s good for me, write my grandmother back. If for some reason I don’t get to that letter in adequate time… well, I’m liable to hurt my grandmother’s feelings. Hurt grandmother feelings, of course, leads to all sorts of guilt from all sorts of family members. News of pen pal activity, or inactivity travels fast in my family. Letter writing isn’t a chore. It’s a nice break from simultaneously writing an email and checking my blog stats and watching stupid cat videos. Letter writing is not technology multi-tasking. It’s easy, breezy, simple… all about just sendin’ a little love. 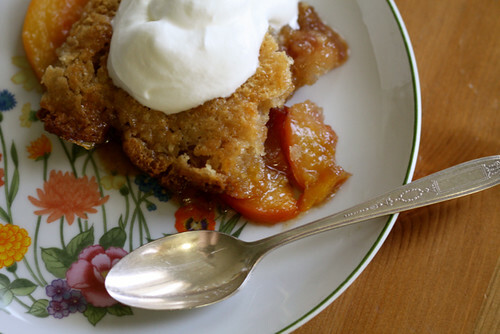 Then there’s cobbler, which couldn’t be any more simple and delicious. 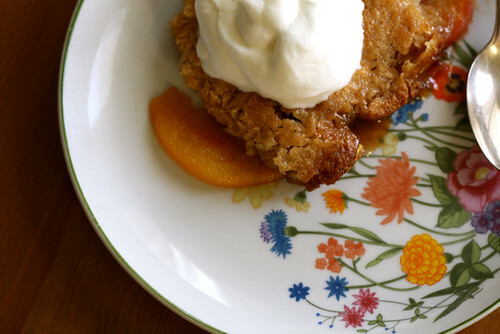 This easy cobbler is like letter writing, in baking form. Spend a little time baking up a little love with this cobbler. Sit down with a nice warm slice and write a letter to someone. It’s supreme. This cobbler just couldn’t be easier to throw together. 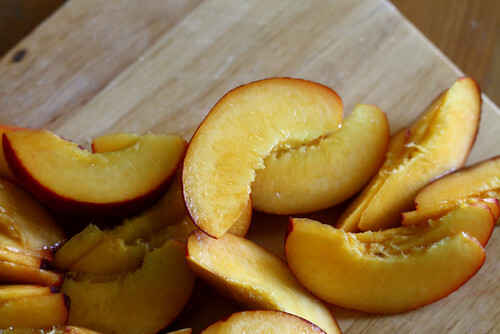 I used delicious golden nectarines as the filing, but feel free to use fresh raspberries, blueberries, blackberries or peaches in any combination. You can also use frozen fruit, although it should be thawed and drained before incorporated. Enjoy summer the easy way. Preheat the oven to 350 degrees F. Melt the butter in a medium saute pan set over medium high heat until it bubbles and turns a nut brown color. Watch the butter closely, as it can go from browned to burnt in just a few seconds. The butter will have all sorts of browned bits in it. That’s good! Pour the butter into an 8-inch or 9-inch square baking dish. Do not try a pie baking dish. I did. Overflow! In a medium bowl, stir together the granulated sugar, flour, baking powder and spices. Add milk and stir. Pour the mixture on top of the melted butter. Here’s the hard part: do not stir! Without mixing, arrange the fruit evenly over the top of the batter. Sprinkle with brown sugar. Bake the cobbler for 40 to 45 minutes, until the top turns golden brown. Amazingly, the batter will migrate from the bottom of the pan to cover the fruit. Yum! Serve warm with slightly sweetened whipped cream or vanilla ice cream. Aw, writing letters I find more intimate and persona. They are very cute and simple like you said. Everyone is so caught up with technology these days. 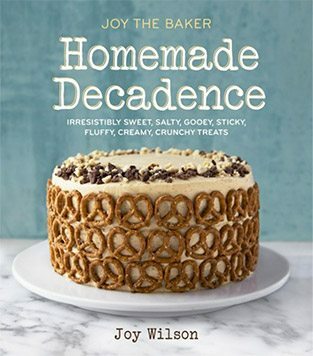 this looks wonderful. i will have a BUNCH of strawberries and blueberries in the freezer from this summer’s bounty so this is a great one to have on hand. 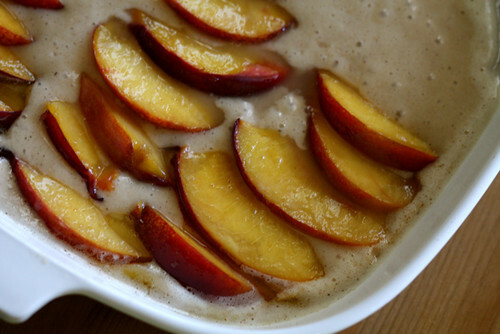 I’ve never had nectarine cobbler–this sounds really good! I love your letter writing with your grandma:) My cousin and I wrote letters to each other long after the beginning of email too, but we have slacked for about five years now. Might be time to revive that! In your second instructional paragraph in the recipe, you have “Pour the batter”, and I think you mean “Pour the butter”… I couldn’t for the life of me figure out where the butter went in between browning and having the fruit put on top of it! This sounds delicious, I feel the need to rush out and buy fruit a.s.a.p.! Joy you are just the cutest. Whenever I read your blog, I am instantly in a better mood, and almost always inspired. Thank you so much for this cobbler-it looks delicious!!!! this looks SO yummy!! i happen to have bought 3 nectarins yesterday so im hoping it will be enough because i really want to make this today. thanks for the recipe!! I love to hear that people still write letters! I still write to my grandma too, like I’ve been doing since I was a kid. And I get just as excited to get a letter in the mail as I did when I was 7, lol. Heyyyy…I think you should arrange some sort of foodie pen-pal exchange program on here, haha. I’m so inspired by you! I’m going to find some really pretty staionary and start writing to my nana and my grandma. I’m going to make them write me back just like your grandma does when you’ve gone too long without writing. Thank you so much for bringing back the art of letter writing! i love the idea of letter writing but feel like, if i wrote someone a letter instead of an e-mail, they’d be like “what’s up with that? why didn’t u just write me an e-mail?” oy, how the world changes. now cobbler though – nothing wrong with cobbler. Living in UK, we don’t really use cup measurements – does anyone know the equivalent in grams????? Oh goodness. Letter writing and cobbler–two of my very favorite things in this world! I’m supposed to be bringing a dessert to a cookout at my BFF’s house this weekend. I think this is it! Tats a Great tradition to keep! Sadly, technology has make many small things obsolete…. anyway, yes, everybody should write more letters. Hurrah for letter writers! I’m a letter and postcard obsessive. It’s just so much more personal and heart-warming to get a letter or card lovingly hand-written, then a rushed email. And this cobbler looks just as heart-warming. I always make crumbles in the winter, but always forget to make things like cobblers in the summer with the golden fruits. Thanks for the prompt Joy!